More than 30 craft breweries from across the state will be featured at the inaugural “Beer Fest at the Connecticut Open” on Saturday, Aug. 25 — the day of the Connecticut Open singles and doubles finals. The tournament is partnering with the Connecticut Brewers Guild and its members to create a new and exciting event that will add to the venue’s atmosphere on the final day of the women’s professional tennis event held at the Connecticut Tennis Center at Yale. A portion of each ticket sold will go to breast cancer research at Smilow Cancer Hospital at Yale New Haven Health. “Beer Fest at the Connecticut Open will be a great way to end an exciting week of women’s professional tennis and support the tournament’s mission to benefit community and support women’s causes,” tournament Director Anne Worcester said. Beer Fest at the Connecticut Open will take place on Saturday, Aug. 25 from 12 noon until 4 p.m. at the practice courts in the upper plaza. Tickets are available online, here, and include unlimited 4-ounce samples, access to the food trucks and live entertainment on the grounds and a general admission ticket to middle-tier seating for the singles and doubles finals. Ticket prices are $40 for beer drinkers ($50 on site on the day of the event) and $25 for designated drivers. 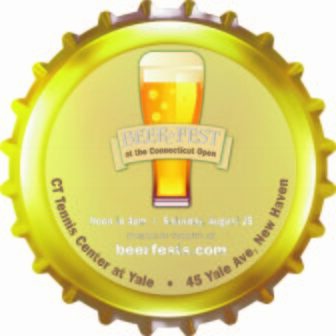 There is also a $25 “Beer Garden extra” ticket for fans who have already purchased a ticket to the Connecticut Open finals (Session 12) and want to attend the beer festival. For more information about the 2018 Connecticut Open, which takes place from Aug. 18-25, including multi-session packages, weeklong box seats, sponsorship packages, hospitality and becoming a volunteer, visit the Connecticut Open website or call 203-776-7331. Daily tickets for the tournament will be on sale starting the week of June 11.